Ramon Coronado works and lives by a simple credo: “Treat people the way I want to be treated.” Lucky for his customers at Los Jalapenos, that also means making food the way he wants to eat it. Cheryl and Eddy Longshore agree. Married nearly 20 years, they celebrate the end of almost every week nibbling on a few chips and salsa, sipping Mexican beer and margaritas and noshing on a Mexican meal. They started this tradition while they lived in Atlanta and have continued it through the eight years they have lived in Bluffton. Last month, the couple happened upon Los Jalapenos, the Mexican restaurant anchoring one end of the Bridge Center, across from Moss Creek Plantation, and they were pleasantly surprised by the visual and taste difference at the independent Mexican restaurant. Cheryl was told that the syrup in the margaritas was made from honey and fresh lemons. It is a “taste sensation” compared to the noticeably pre-packaged sour mix most restaurants use, she said. “The first sip made me stop and savor; the touch of honey really made the margarita extremely smooth and, quite frankly, delicious. Eddie, who is a beer drinker, kept sipping from Cheryl’s straw and making extraneous comments about how good the popular Mexican drink was. According to Coronado, what distinguishes his restaurant from the Mexican restaurant chains is the ability to change up recipes the way he and his customers want them. 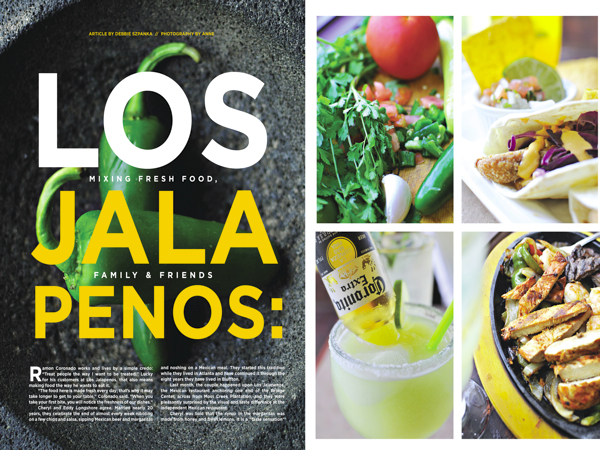 “Many people confuse us with the restaurant chain Jalapenos; we are plural—Los Jalapenos. That how you tell the difference,” Coronado said. Just like the Longshores, Coronado moved to the Lowcountry for a better quality of life and to get away from the hustle-bustle of Atlanta. He opened Los Jalapenos December 27, 2011 and has been trying to get to the word out ever since that his restaurant, tucked away in the Bridge Center, has some special items on the menu, special people serving them and as Cheryl found out, a special recipe for margaritas. Surrounded by fresh ingredients in the kitchen, Coronado is also surrounded by special people. Two of his daughters, Cruz and Josie, work side-by-side with him, along with his niece, Gladis. “This is my life. I spend more time here than anywhere else, so it’s good they are here with me, too,” Coronado said. Josie said she likes working and being surrounded by her family as she stashes her tips away to help pay for college. Even those who aren’t blood relatives become family at his restaurant. “There are three guys who come in almost every day and all three are named David,” Coronado said. “It’s like the old television show, Cheers. We know what they want, how they want their drinks, and we also know everything about them—and they know a lot about us.” Coronado laughed when he remembered one of the guys coming in one afternoon to buy a gift certificate for his buddy and, hours later, his buddy came in to cash it out. Recently, Coronado made his version of Mexican chicken wings and had the “Davids” test them during their nightly happy hour. Coronado made the chicken wing sauce from tomatillos, which resemble green tomatoes with a spicy kick. While not on the menu, you can ask for this manager special. One of the special treats at Los Jalapenos is the choice to have your guacamole and salsa made tableside as you watch the server mash and mix the fresh ingredients. The 16th century sauce or dip, first made by Aztecs, is made today with avocados, jalapenos, tomatoes, onion, cilantro and freshly squeezed lime juice, accented with sea salt and garlic. Cesar Azcarraga, server and master guacamole maker, said it’s fun to make salsa and guacamole in front of his customers and he enjoys making it to their order. Eddy was thoroughly impressed with the presentation, and even though he has vacationed to Mexico and lived in big cities, he has never had his guacamole made tableside and taste so good, he said. The Longshores tested the challenge to order an off-menu item, and their choice was fish ceviche, made with tilapia, garlic, cilantro, peppers, cucumbers and tomatoes. “No doubt, the freshness is beyond comparison to other restaurants. The visual presentation and taste of each dish is terrific,” Eddy said. “That’s what makes a restaurant fun,” Coronado said. Even though the menu boasts nearly 200 items and combo plates, if a customer wants something not on the menu and the ingredients are available, no problem. According to the Longshores, while it’s nice to have that many menu options, the homemade guacamole and margaritas alone make it worth the trip. “It’s funny; we threw toothpicks to decide who could scrape the guacamole bowl with his or her finger,” Cheryl said. Los Jalapenos is located at 1540 Fording Island Road, Hilton Head Island or you call them at (843) 837-2333.